In these waning days of August, I am grateful to have rediscovered the pleasure of beach and sand and leisure. My favorite beach, Goose Rocks, on the southern coast of Maine, runs two miles between two tidal-fed rivers. Three summers ago, Marv and I sold our beloved cottage at the rear of the east end of the beach. We bought it nearly twenty-five years ago as an investment for our later years. After we turned the keys over, I needed time to mourn; for two summers, I could not bear to revisit. Thankfully, this past week, renting a sweet house on the Rachel Carson Wildlife Refuge on a marsh at the west end of the beach, changed all that. Old memories were replaced by new ones— similar, yes, but filled with a refreshed sense of wonder. Although two summers had passed, my body slid into groove. The tide was right. 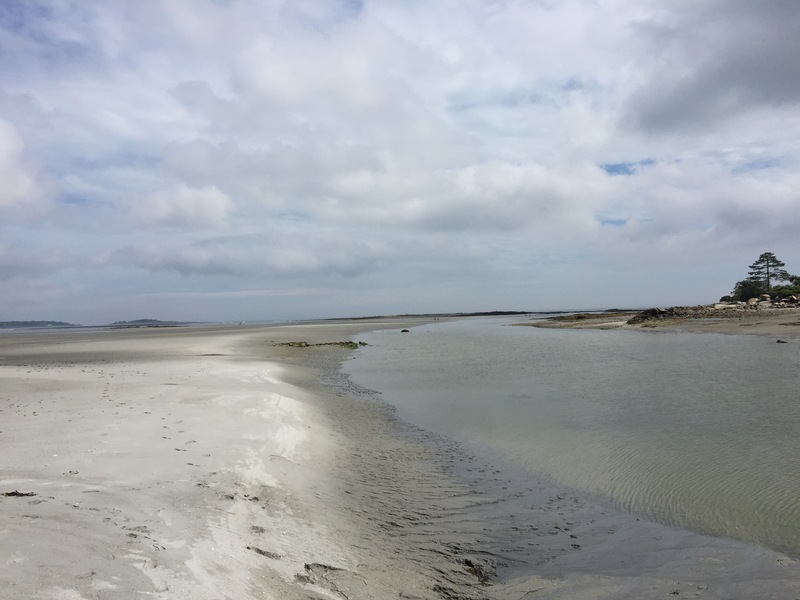 I navigated straight north, onto the wet, open tidal flats to the rock-filled island usually below the surface. After a rain, in solitude, I walked the long expanse. I felt soothed as I rocked up and down on the tilted triangular rises etched by gravity’s pull. 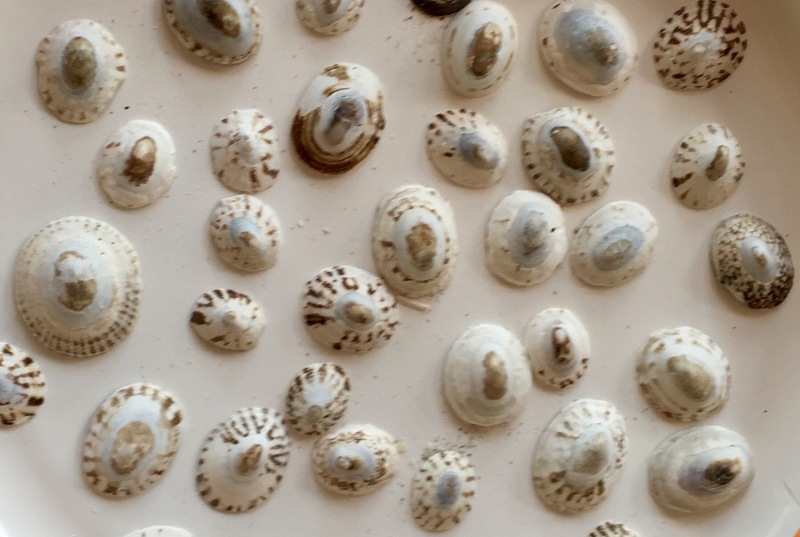 It was as it had always been—on every return, the impetus to scan for limpets, the dome shaped gastropod shell I collected and piled into two-quart jars all those past summers. I was not disappointed. Almost immediately, a tiny but perfect shell revealed its presence. As always, I cupped it into the palm of my hand and spoke to it, giving thanks to the universe for what was beautiful and familiar, my welcoming talisman. Such focus, the blend of heart and body, the breadth of beach, the lull of the surf is possible only at the edge. It is the synchronicity of pulse, breath, the rhythm of the watery wash, which infuses and inspires my spirit to search. I welcome anew the remnants of what is hidden beneath the ocean’s surface. Each limpet, whether blue or brown, whether etched with fresh markings or worn and faded white, offers a story of a life once lived beneath the sea. The limpet cleaves out its permanent shelter by boring into a rock, shaping a ridge to fit its form. Daily, it swims with the rise of the tide, searching for food, making its way back as the tide recedes. The limpet’s propensity to return to the rock’s ridge is attributed to some type of chemical response. It leaves a trail of chemical markers, its own individual protein and polysaccharide signature, which cannot be scrubbed off and which endlessly provides the limpet with the cues for its homecoming. This remarkable member of the gastropod family is among the oldest forms on the planet, a survivor over eons. The limpet evokes and holds memory, the promise and pleasure of my own leap into the tide of rising words and the gratitude that flows as my pen shapes images and stories onto the page. This entry was posted in Creativity, Happiness, Mindfulness, Nature, Relationship(s), Sustainability, Uncategorized, Well-Being and tagged Goose Rocks Beach, Limpets, rising words, sauntering, shell collecting on September 5, 2016 by fayewriter. I like how discovery unfolds in this piece, and how the writer emphasizes her return to the cherished beach by describing a creature who deliberately and daily re-finds its own carefully carved-out space. References to the tide seem to echo this pattern of repeated returns. Rosemary, thank you for your return and, as always, for your astute literary reflections. Thanks, Sheila. I remember how we both noticed that gorgeous rolling shell at the same time and then worked out a way to share it. I think this is my favorite piece. when reading your words, I feel as Though I am with you on the beach. It also seems to me you have seized a little bit of time and eternity in your admiration for this sea creature. Claudine, I’m very touched by your comment, “you have seized a little bit of time and eternity.” Yes,I experience awe and wonder over its simple beauty and ability to navigate in rough and quiet seas….so much can be learned and taken from its habituation. Beautifully written. You conveyed a deep spiritual moment .must have been so gratifying! Makes me wonder whether one can go home again. Hy, such an interesting comment— whether or not one can go home again. There is always the lessons of the tides. Late August is when I first realized that there were pathways open to the hidden islands because of how low the tide can retreat that time of year. The choice of that particular week was serendipitous and the fact that the tide was lowest around noon of my last day was luck or perhaps, my unconscious leading the way. Everything lined up and allowed me to “go home again.” Indeed, I was in the present and past, a most gratifying experience. Lovely post today, Faye! You make me long to visit the southern coast of Maine. Yes, Heather. You must put it on your bucket list. It is truly a place that calls out. Faye… makes me want to walk that beach and smell the ocean, feel the breeze and the sand between the toes! Thanks, girlfriend, how sweet it was! Know you know…. Oh Faye! I remember the afternoon when you and I walked together on Goose Rocks Beach in the winter, almost twenty-five years ago. We were the only people on the beach. We had excitement in our hearts as we walked along, and although it was cold and windy, we both loved being immersed in the elements of the sea. Now you have brought me back to Goose Rock Beach, on your return after two years, and I am grateful! You touch the heart of the sea with your words. I feel the beauty that you so poetically express. Bev, of course I remember that first and most unique, challenging and dramatic walk— crazy and fun—including the yummy stop at Allison’s for lunch. I’m grateful this post brought you back to the sea and our special memory.